In his Google I/O session Best Practices For Architecting Your GWT App, Ray Ryan discusses the benefits of using an event bus in GWT (Google Web Toolkit) applications. Inspired by this talk, I decided to try my hand at building a simple GWT event bus modeled after our pure java event bus. If you’ve followed along with the previous event bus blogs, you already know what I mean by simple – simple to use. We want an event bus that doesn’t require a fleet of event classes or fireXXX methods. We want to call a method, like newSearch("GWT event bus"), and have it automatically invoked on all observers as if we’d called each one ourselves. We want method multicasting. As you can see in the code above, we use the same SearchListener interface to both observe newSearch events and publish them. In the original event bus we used reflection, specifically, we used Java’s dynamic proxies to accomplish the publisher-listener magic. GWT doesn’t have anything like this, but it does provide hooks into the compiler for code generators. Basically, we can generate the publisher code at compile to perform the same function dynamic proxies did at runtime. Code generation happens (it seems) during GWT’s precompile phase. The actual compiler hook is triggered by a combination of a GWT.create() call in the Java source and a generate-with element in the GWT module XML file. The GWT.create method takes a class literal to instantiate – GWT.create(PublisherFactoryRegistry.class) in this case. The generate-with element tells the compiler that EventPublisherGenerator will create the Java source that extends (or implements if it were an interface) PublisherFactoryRegistry. For more details on the GWT compiler, watch Ray Cromwell’s Optimizing apps with the GWT Compiler session at Google I/O. No threading also means no executor service, but we’ll use deferred (or scheduled) commands to simulate it. The old, pure Java getPublisher method would implement the listener interface using a dynamic proxy. The proxy would publish events to the bus whenever called. This new GWT event bus keeps a registry of factories to create publishers that implement each type of event listener interface. Publishers also extend the EventPublisher class which allows getPublisher to initialize them with the event source, topic, etc. Like the non-GWT version, publishers queue events to the bus when called. The only change to publishEvent is in how it schedules event delivery. The new method uses GWT’s scheduler service (formerly called deferred commands) since executor services are not supported. Changes to deliverEvent are also minimal. The cleanupGarbage() call is removed since we don’t have soft references to clean up and currentEvent is demoted from a thread-local to just an instance field. Let’s take a look at the code we need to generate. Here we produce two kinds of classes: a event publisher for each event listener and one PublisherFactoryRegistry implementation to hold the publisher factories. Publishers implement the event listener interfaces, convert method calls into events, and publishes the events to the bus. The code generator seeing the above SearchListener interface will create the following SearchListener__publisher class. Each implemented method creates an event object containing things you’d expect like event source, topic, and arguments. Since we don’t have reflection, the event object also contains an EventDispatcher to invoke the observer’s method when directed to do so by the bus. The PublisherFactoryRegistry class is used by the bus to find factories that create publishers (like SearchListener__publisher). The concrete PublisherFactoryRegistryImpl we generate is only there to register a factory for each publisher we generate — by putting it into the publishers HashMap. You can tell the GWT compiler to keep the generated Java code around for you to review. Just add the -gen folder compiler flag, where folder is the path to generate temporary files. The contract for GWT code generators is to extend com.google.gwt.core.ext.Generator and implement its generate(TreeLogger logger, GeneratorContext context, String typeName) method. The implemented method should return the name of the generated subclass for the type passed into GWT.create. As you review the code, you’ll notice that we’ve added several helper classes (ClassDeclaration, ClassBuilder, CSV, etc.) to make the code less verbose. We’ve created an init method to act as a poor man’s constructor for the generator. It uses the compiler’s metadata registry (TypeOracle) to lookup several classes we’ll need later. The no-arg generate method is where the work starts. Here we create the PublisherFactoryRegistryImpl class and give it an instance initializer where the factories are registered. We also call createPublisher() to generate the code for the publisher implementation for each EventListener sub-interface. The visitor pattern is used here to let us focus on code generation while delegating the EventListener finder logic to visitEventListeners(). The visitor’s visitClass method is called for matches, while partial matches emit a compiler warning along with the reason for the mismatch. This lengthy method creates the publisher implementation. It implements each method in the event listener interface to publish its description and payload as an event to the bus. The downlad for this blog includes a simple search example to demonstrate using the event bus. You can run the EventBusExample module (/src/com/northconcepts/eventbusexample/EventBusExample.gwt.xml) or try out the precompiled app by browsing to WebContent/index.html. StatusUI – shows search progress and results summary. 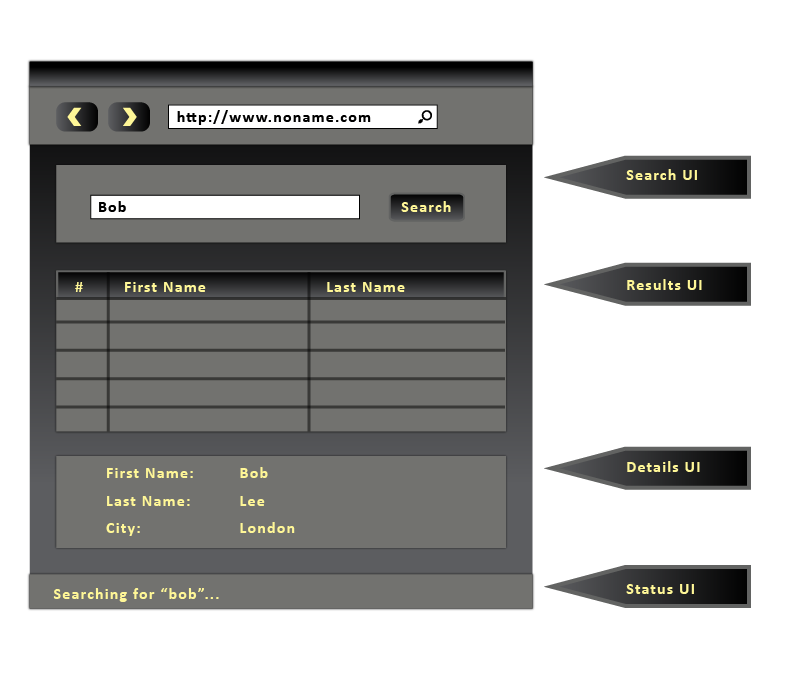 The actual search function is performed by a non-visual component called SearchEngine. Like the display areas, it also plugs into the bus to both observer and publish events. When the user fills in the text field and presses the search button, the SearchUI publishes a newSearch event to the bus. The SearchEngine receives the notification and runs the search. The StatusUI also receives the notification and displays a search-in-progress message to the user. When the search is complete, SearchEngine publishes a searchFinished message to the bus. The ResultsUI receives the notification and displays the data, if any, in a table to the user. The StatusUI also receives the notification and displays to the user either a message with the number of results found or a message that none were found. If results were found, the user can click one of the items in the ResultsUI which will publish a detailsViewed event. The DetailsUI will receive this event and display all the data for the selected record. While GWT doesn’t support Java reflection, it does provide a powerful code generation facility. Code generation has the benefit of enabling dynamic, reflexive programming without the runtime cost. Once you get used to GWT’s approach, you’ll start seeing many opportunities to reduce your code size by leveraging GWT’s generators.